So, my piece is more than a little underdone, but I thought I'd share what I have anyways. It all started with this hat. It's a cute hat, but rather plain. Wouldn't it be nice, I thought, to remake it for spring, like ladies used to do in times past? So I traipsed down to the ribbon store for ribbons, to find a new hat band as a first step in the process. 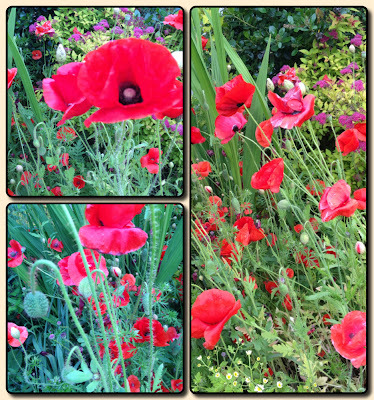 Meanwhile, the poppies have begun blooming in my yard, which was my deadline for creating a piece using Lynne Bowland's lovely enameled poppies. 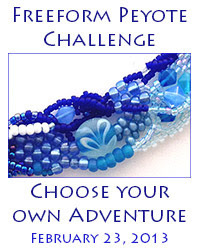 Wouldn't it be fun, I thought, to create a beaded hat ornament? Freeform peyote always looks so awkward in its early stages! I'm using greens and neutrals for most of my beading to provide a neutral background for the enamel poppies. I do like how the curl at left echoes that of an unopened poppy bud. Since it's obviously yet complete, my fall-back plan is to have this finished by the end of the week. So, if you're curious how it will turn out, check back on Saturday and I'll let you know! Now time for bed as I really am up at 3:00am finishing up this post. Hope it makes sense when I look at it in the morning! Your charming hat and the beginning of your design take me back to summers of sand dunes, cobblestone streets and a slower pace to life. Can't wait to see it finished! There was a time while I was in elementary school where I got a new hat every Easter. I loved those hats and wore them all year long! What a great inspiration to use poppies - such a happy flower. It's looking great so far! This is coming out great! I can't wait to see the finished piece! I can't wait to see the finished piece. I love those enameled poppies! Fantastic hat:-) Beautiful poppies and wonderful 'free' piece,You've started.I also would like to see the final effect.I bet-it's going to be very interesting in texture and colors. You almost have me.....almost! Love your freeform! And yes the ribbon springs that up awesomely! I swear I was not trying to play coy with this post! Scout's honor! :) I knew I was going to be working on this last minute, simply due to other deadlines, and then I ended up working all weekend unexpectedly stealing away my beading time. So I've set the Saturday deadline to force myself to finish this project that I really do want to complete. Otherwise, I could easily see it becoming one of those beloved UFOs, languishing on my beading table. Thank you for participating in mine and Christine's challenge. 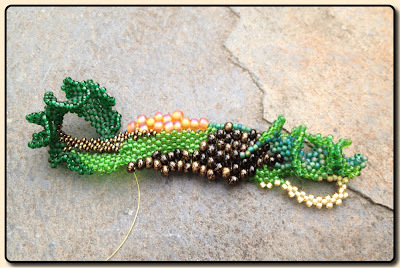 I love the start on your peyote freeform hat ornament it is going to be gorgeous when you are finished. I will be back on Saturday to see the finished piece. Great job so far! Oh, jumping up and down excited! What a cool idea! I so love the curls, and those enameled poppies are rather gorgeous, it will make a stunning statement on the hat. Can't wait to see the finished piece!!! Now, go take a nap, crazy woman! I really like this, the curls are fabulous, and I just love the poppies, too. Nicely done! Loving it! 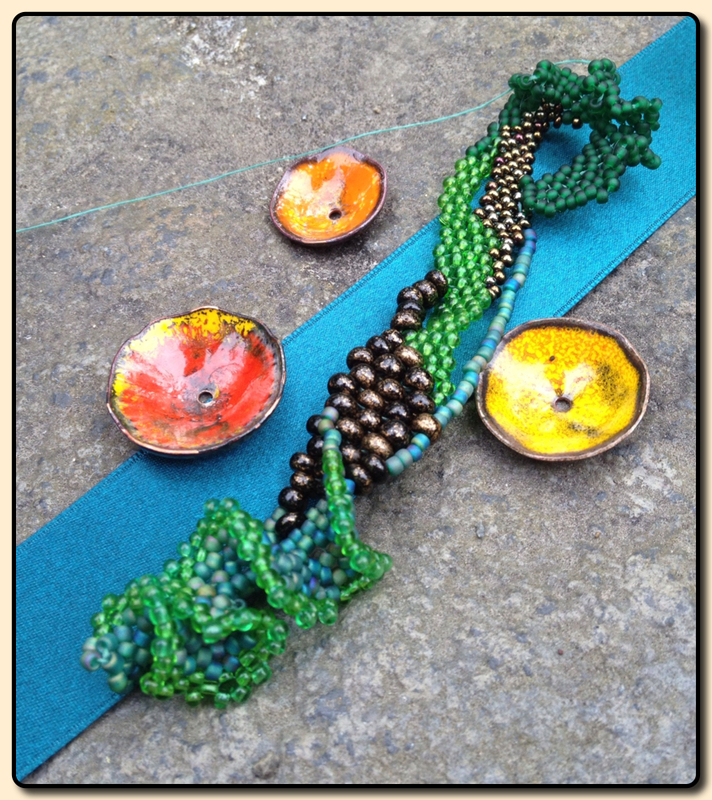 I am so glad you posted your work in progress...it is really exciting to see how these beautiful things come together. 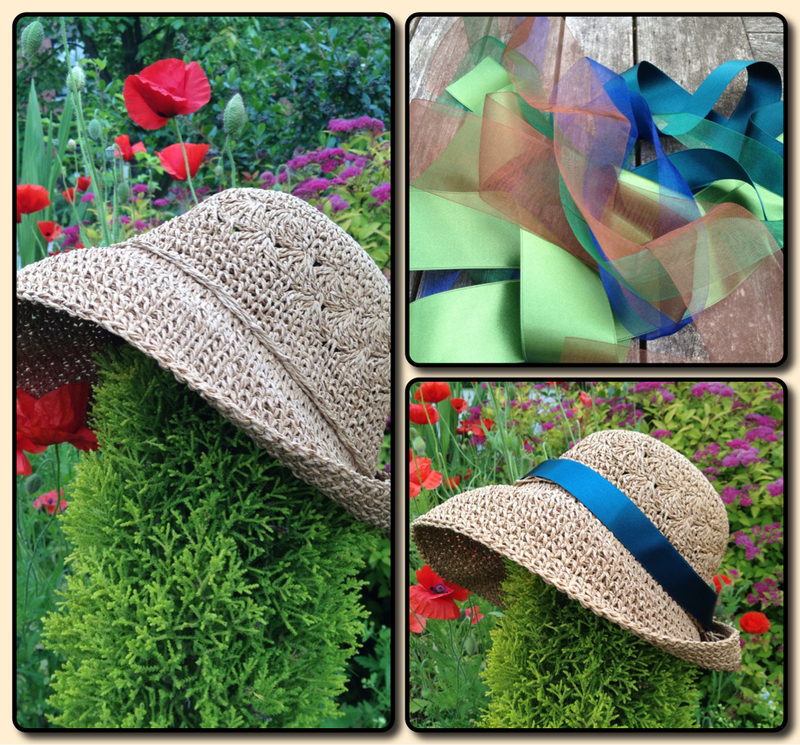 The hat band is a fantastic idea and the poppies will make it all pop. The curls all make me smile too :-) It is looking beautiful Karen! And believe it or not, I am starting my freeform adventure this week. Finally, I have the time and focus to put your fantastic book to its fullest use! Last night as the light outside was starting to fade, I thought about sending you an apology note saying that I just didn't make it this time. But I really didn't want to bail, so instead I grabbed my camera and supplies and ran out into the garden for a last minute photo shoot and figured I'd do one of my 'progress report' posts. Love what you've done so far ... I can't wait to see it with the poppies! What a great idea this is, and I love where it is so far! Can't wait to see it with those fabulous poppies and ribbon incorporated. Then when you're done, you'll have a perfect hat to come to next year's Kentucky Derby -- see, no excuses not to come visit! I completely understand your angst. 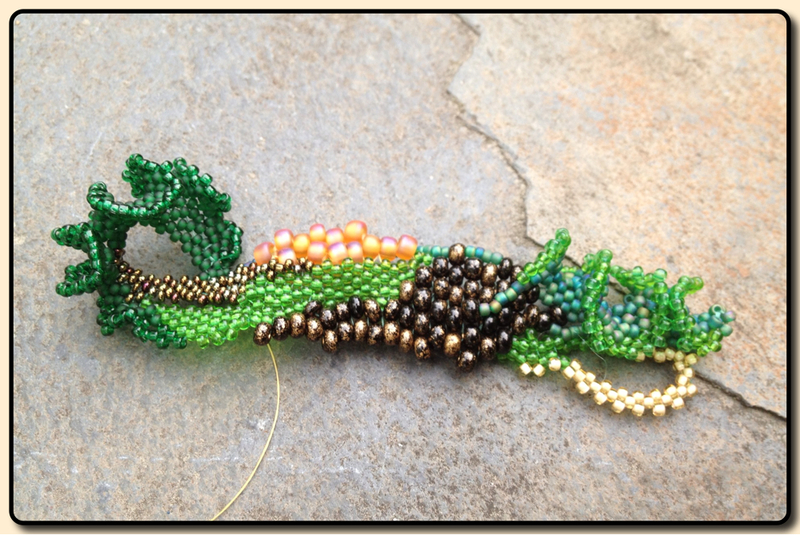 I had a freeform peyote project in the works as well that just didn't make it because they are a work in progress. Sometimes a lonnnng work in progress. You can't rush it so mine will get done later as well. Your work is beautiful and worth waiting for! It looks beautiful, Karen! Since I have given up counted cross stitch due to aging eyesight, beadwork probably isn't for me, but that won't stop me from admiring everyone's lovely handiwork. Your idea sounds so lovely and I cannot wait to see the finished piece. 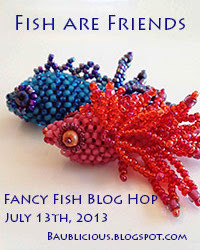 I love the start of it .. your freeform is just beautiful and perfect for your enameled poppies. I will be stopping back... I can't wait to see the finished piece and where the enameled poppies come into play! You are off to a lovely start!! P.S. 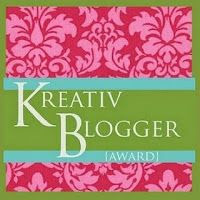 Karen, thank you again for your help, I will definitely be purchasing your book! Personally, I love how your project is coming along so far, but it's so comforting to know that I'm not the only one who feels like her freeform looks awkward in the beginning. I'll definitely be back on Saturday! 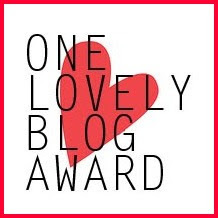 What an awesome idea, and gorgeous photos! A feast for the eyes, and I can't wait to see how it all turns out! Wow! What a great idea. I just love seeing what everyone comes up with. And the enamel poppies are gorgeous. Can't wait to see the final product. 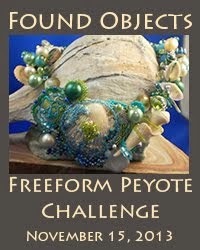 Freeform peyote...I already see the earth, the grass and then the poppies! I like your start on the hat ornament The enamels popies are outstanding. I can't wait to see the finished piece.